Brace yourselves. I'm about to give some people a migraine from rolling their eyes too hard. Like many "old-school" fans, the original Universal Century timeline is by far my favorite of the Gundam multiverse. It is the least flashy, yet packs the biggest punch in a science fiction universe that, unlike the other spinoff series, actually gives a logical reason (see below) as to the existence of giant humanoid mechs. So, when I first heard that a new Universal Century Gundam series, Gundam Unicorn was in development, I was vehemently against the idea. It seemed like an unnecessary addition to an already complete story, and a quick cash-grab by the creators. Basically the God Particle of the Gundam universe. 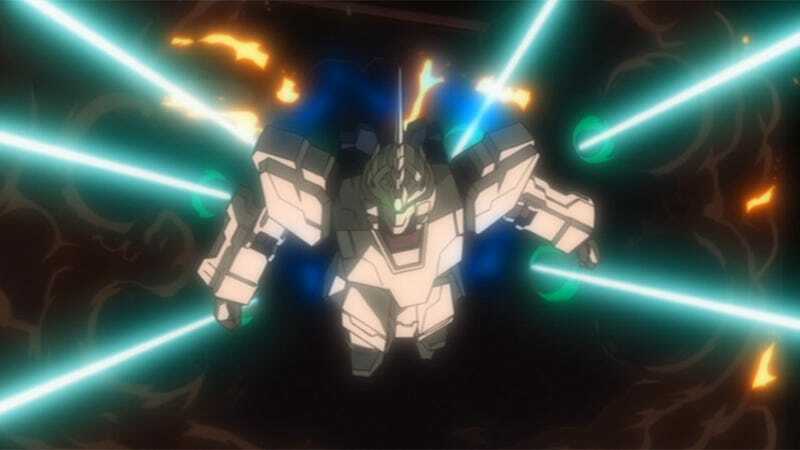 The Minovskey Particle is a byproduct of nuclear fusion that disrupts electromagnetic signals, radio waves, and to a certain extent infrared light, and is the entire reason that Mobile Suits (see below) exist. When dispersed over a wide area, radar and guided weaponry are rendered useless, forcing all combat to take place within a visible range. Communication in a Minovskey Particle-rich space can only be conducted through laser beacons and flares or a direct contact communication system. Minovskey Particles, when compressed, become hypercharged and can be fired as a high-energy projectile, called a Mega-Particle. Almost all "beam" weapons in the Universal Century timeline are actually Mega-Particle-firing weapons. Minovskey Particles can also be utilized in creating anti-Mega-Particle barriers, called I-fields. The official name of the giant humanoid mechs you see throughout the series. The non-humanoid type of mech is called a Mobile Armor. Originally the name of one of the prototype Earth Federation Mobile Suits. The original Gundam performed far beyond any of its creators' expectations and became world famous. As a result, any Mobile Suit that shares the Gundam's basic design (twin antennae, twin-eye camera, red chin) is referred to as a "Gundam-type" or "a Gundam." After space colonies were constructed and populated, humanity was united in a single Earth Federation and the Gregorian calendar was abandoned for the new space colonization age called the Universal Century (often abbreviated as U.C.). In the new age, a new form of discrimination between Earthborn (Earthnoid) and Spaceborn (Spacenoid) lead to the space colonies living under the rigid control (and borderline oppression) of the Earth Federation. A popular anime-centric magazine published in Japan. In the Gundam universe, however, a Newtype is a theorized next step in the evolutionary ladder. Newtypes are humans adapted to life in space. Newtypes are characterized by faster reaction and physical coordination skills, quick adaptive and understanding abilities, and a high level of empathy—sometimes bordering on telepathy with other Newtypes. It is possible to create an artificial Newtype through medicinal and surgical means, but the resulting Newtype, called a Cyber Newtype, usually lacks the compassionate empathy of a "true" Newtype and is often mentally unstable. A space colony government. The original Zeon leader, Zeon Deikun, preached of a future where all humanity would evolve into Newtypes, and they would be able to live in harmony and understanding. He was soon after assassinated, and his rule was usurped by the Zabi family that went on to wage war (later known as the "One Year War") against the Earth Federation. The Zeon government was eventually defeated and the leading members of the Zabi family killed, but different factions and remnant forces remain scattered throughout Earth, with colonies waging guerilla warfare or harboring an undying animosity towards the Earth Federation. A military organization under the Earth Federation, but granted a certain level independent autonomy. Anything that appears in the Gundam universe with the word "Psyco" in it is Newtype-specific technology. Psycommu weapons are remotely controlled weapons (often called Funnels) that are controlled by the brainwaves of a Newtype pilot and are thusly unaffected by the disruptive properties of Minovskey Particles. A Psycoframe is a material made of microscopic computer chips that react to a pilot's brainwaves. This material can be embedded in the frame of a Mobile Suit to theoretically enhance its reaction speed. One of Japan's most iconic characters from the Gundam universe. Wears an outfit that kind of works in the anime but is corny as Hell in real life. -He was a Zeon pilot from the One Year War who was known as the "Red Comet." -He was the son of Zeon Deikun. -He became a charismatic leader for the Zeon remnants (Neo-Zeon). -He tried to force all humanity to live in space (and thus accelerate their evolution into Newtypes) by dropping an asteroid onto Earth in a conflict known as the Second Neo Zeon Conflict, or Char's Rebellion. -After the Second Neo Zeon Conflict, Char disappeared and is presumed dead. There is obviously much more lore and information that could be explained about the Universal Century canon. But for watching Gundam Unicorn for the first time, this will probably give you a more solid footing without having to wade through page after page of Wikipedia links. Most other things are explained within the series itself. Gundam Unicorn Episodes 1 through 5 are currently available in DVD and Blu-ray format as well as digital rentals on the Japanese PlayStation Store with subtitles (which looks to be the new trend in blockbuster anime releases). Gundam Unicorn Episode 6 hits select theaters in Japan from March 2nd to March 16th.